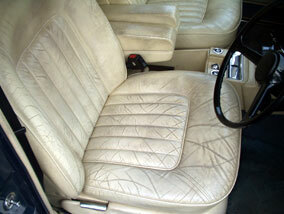 Product description: Leather restoration, recolouring & colour change kit to dye leather. 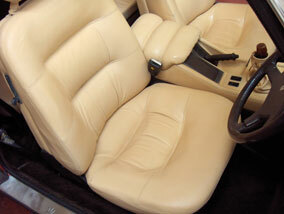 Used to restore or colour change leather car interior, upholstery, furniture and all other items of leather. Can be used on all leather and is perfect for repairing leather colour damage on sofa, car interiors, shoes, jackets and much more. Just thought you might be interested to see the amazing results I achieved using your products. At first after browsing your site, I was quite skeptical - the usual 'Before' and 'After' shots being the 'best of the bunch'. 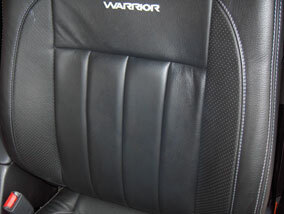 I can confidently say, after a weekend of very satisfying work I am stunned by the results, and very impressed on how durable the products have made the surface of the leather. 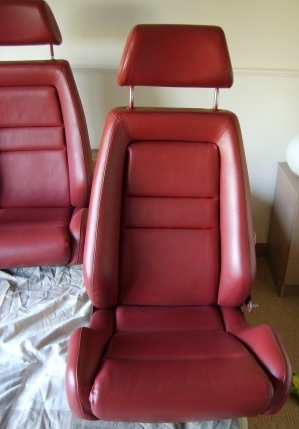 The seats are out of a TVR and I thought I may have been trying to be too ambitious about the drastic change, but they have worked out perfectly. The repair kit has also done a fantastic job of repairing the bolster damage, so much so - you have to get very close to even see it. Thank you for the help and advice. Please feel free to use the photos on your web site. 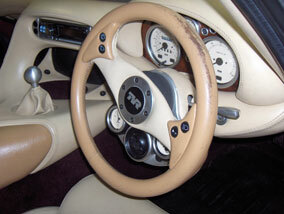 Already recommended you to someone on the Pistonheads TVR forums, after posting the photos. I am writing this letter to tell you how pleased I was to find your firms name come up on google. 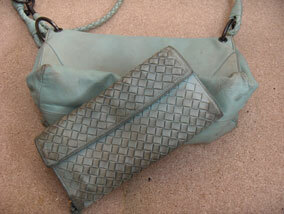 Thats all I did was to put (leather dye) and up your advert came. 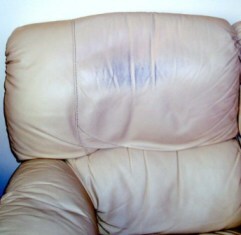 I had your product to do a badly marked stain on the back of my settee. The mark to me was almost impossible to repair but I have to say it came up wonderful, I cannot see where it had been, what a great firm you have, I will recommend your firm to anyone. Yours Truly, with many thanks. T.J Davies. and it was easy to do, which i was very surprised about the entire kit cost me approx £65 but i still have loads of dye left over just incase i have an accident?? but as a rough guide, here is how i did mine/another set. 1, using the leather prep that is supplied in the kit, apply the leather prep onto the leather using a firm pad, i used an old megs cutting pad. make sure you get into every nook/cranny. 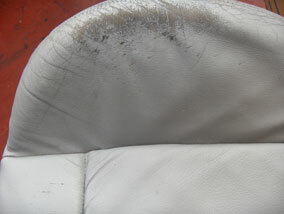 The crap that comes off the seats is the most horrible sticky stuff ever, so make sure you use some very thick gloves. 2, you then need to "key" the leather for the paint, i ended up using some 200 grade wet "n" dry for this, also use the smallest amount of the leather prep when doing this. 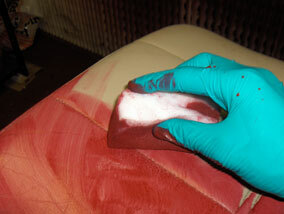 3, you then need to apply the first coat of your leather dye, i tried it a number of ways, and this was the best way i found. 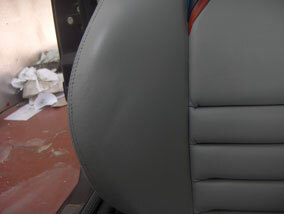 using a firm bristle paint brush, just paint it on, but only do very small patches at a time, approx 6" at a time is fine, if you try and do an entire seat back in one attempt?? you will have the most awfull mess to try and clean up. 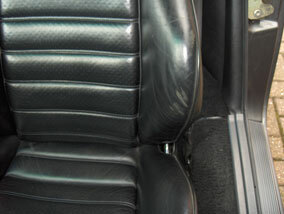 Also the brush is very good at getting into all the seams in the leather. 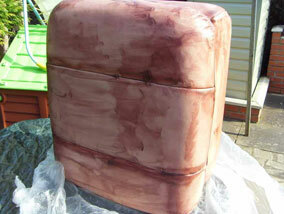 4, when the first coat is dry, which does not take long, mine was dry in about 15mins when it was outside in the sun. 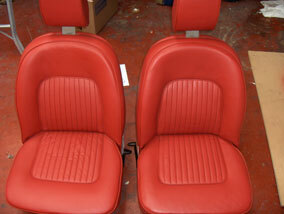 then using the airbrush kit (supplied) go over the seats again with your chosen colour of dye. you will be amazed what results you will get from the poxy airbrush, just make sure you take your time getting the sprayer covering everywhere. 5, when the seats are dry. you then go onto the last stage. 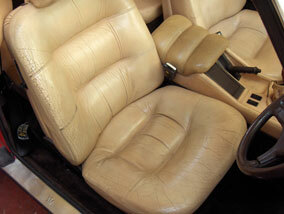 you then have to apply the leather finish. when you order the kit you decide on matt or gloss finish. 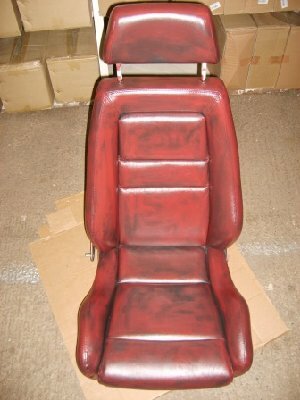 this stage is soooo easy, just use the airbrush again and go all over the seats using the leather finish, i did 2 coats just to be safe. 6, seats are dry?? i would leave them overnight to allow the dye/finish to cure. the attched 3 pics show the sets when i bought them, after the first stage of painting them using the paintbrush method, and then after they have stood overnight in the spare bedroom. 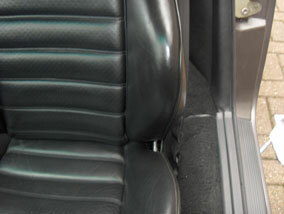 i have also done the leather inserts of my doorcards to match. 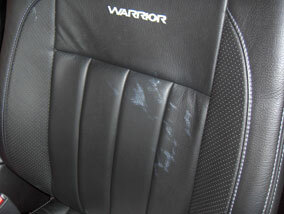 P.S: so far the seats have been dyed for over a year with no pealing at all, and its my daily driver. 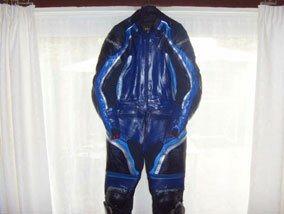 hi, i brought a medium leather colourant kit in blue gloss as i have just bought a new motorbike in blue but old bike was red hense red bike leathers as couldnt aford new leathers found your web site decided to give it a go to save money. BEST £55.00 pounds ive ever spent the result is brilliant im well pleased would recomend your product to anyone. 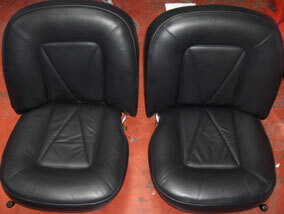 Hi just thought I would send you a photo to add to your portfolio of the work that I have done using your products. I enjoyed using the products and found them easy to use, but with me being fussy I wanted it to be perfect. I hope you think this is a good job. Thanks for all your help and advice. I will definatly be using you again and recommending you. 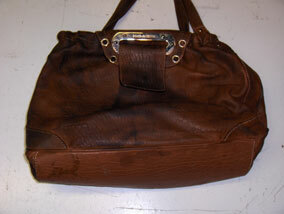 ***a Leather Repair Kit was also used, to repair the tear. Thank you for your fast delivery. I followed your instructions and I am delighted with the result. 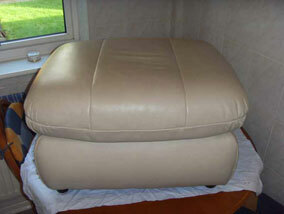 We bought a new brown suite and I wondered if I could dye our old white pouffe to match. I found your website and decided to invest £35 for your small kit. Never having done anything like this before, I hoped but did not expect such a good result. 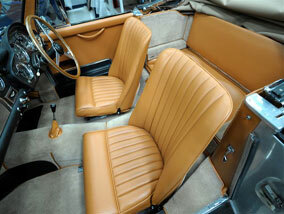 interior of the car is almost like new. wanted to make sure it was ok to. May I please hold onto the compressor until I have done the green? 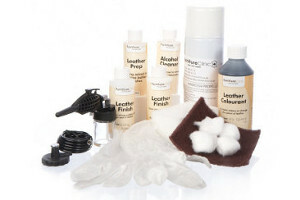 This Leather Colourant Kit can be used to repair worn patches or can be used to restore or change the colour of furniture, car interior, clothes, shoes and any other item of leather. The Leather Colourant Kit is not just a standard leather dye but an actual process, which gives fine results every time. Developed by professionals in the leather manufacturing industry, our Leather Colourants are not just standard dyes, but water-based dye finishes used to give a long-lasting, durable and flexible finish. 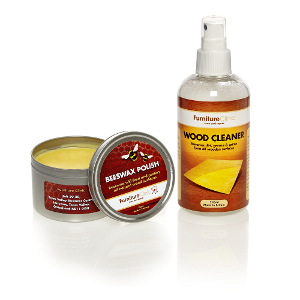 As well as being non-hazardous and non-flammable, this kit is easy and safe to use. 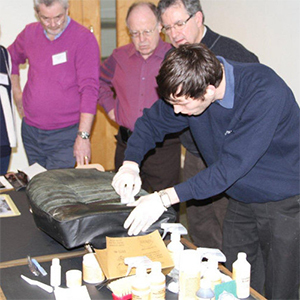 What makes our leather colourant kit the best? 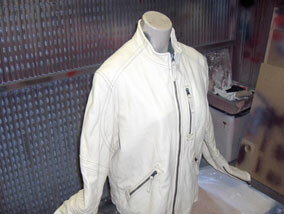 We use water-based colourants, a traditional technology that has been used in the manufacturing of leather for years. 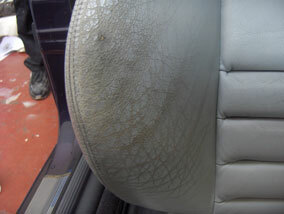 The end result looks like brand new leather. 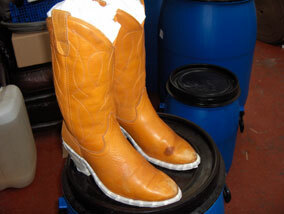 This is because the product is applied in the same way as in a tannery. 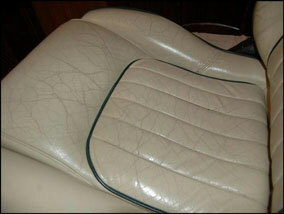 Once applied, your leather will look and feel like natural leather, it will never flake, fade or peel off. 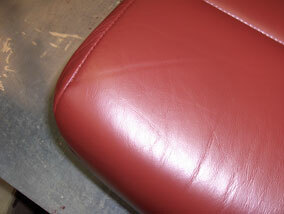 How it works: First, you remove the manufactured finish from the leather with the leather prep. 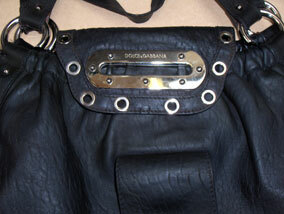 This allows the colourants to adhere and penetrate the leather, giving a sound base covering. 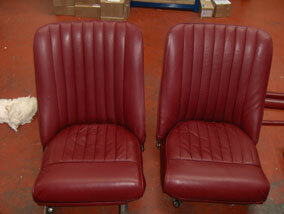 You then spray on a coloured coating for uniformity and to get a nice natural finish. 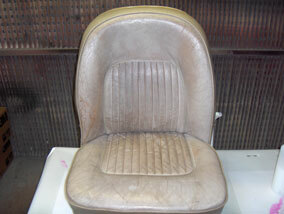 The job is then sealed in with a professional leather finish. 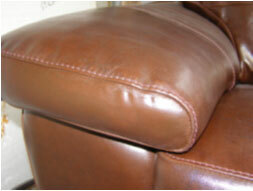 This finish protects and enhances the leather and stops it from wearing out. 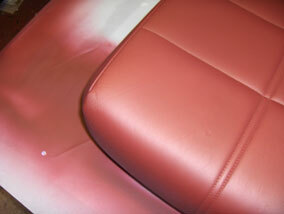 Once applied, our colourants and finishes are so tough, you will find it difficult to even scuff or scratch the leather! How long does it last? 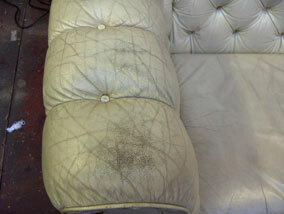 Once applied to leather the coating is as strong as new leather, this has been tested to British & European Standards. 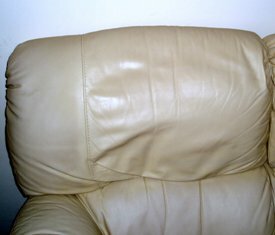 It is difficult to give an exact timescale as to how long it will last, but we are confident to say that it will last as long as your leather originally lasted, i.e. 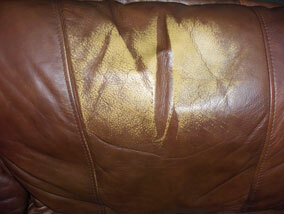 if the leather needed to be restored after 5 years, expect it to last another 5 years. 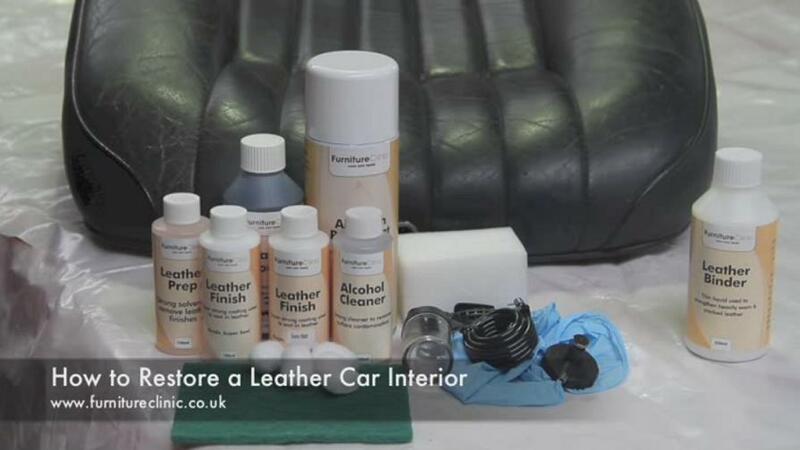 Leather Colourant Kit can be used to change or restore the colour of furniture, car seats, clothes, shoes, handbags, equestrian leather and any other item made of leather. 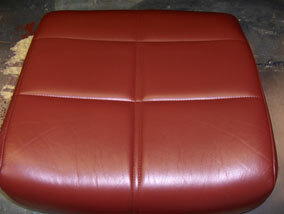 If you require a custom colour, matched exactly from a sample, we offer a quick and easy colour matching service. 1. 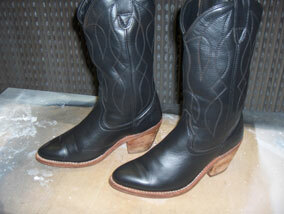 Get a sample of the leather to be matched. 3. Tick the box to tell us you are sending a sample when ordering. 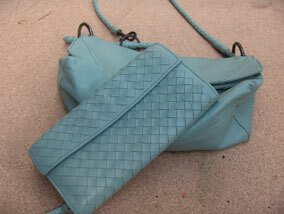 Small Kit - Will restore anything up to the size of a car seat, including handbags, clothes or shoes! 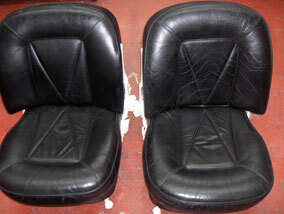 Medium Kit - Will restore anything up to the size of a large armchair! 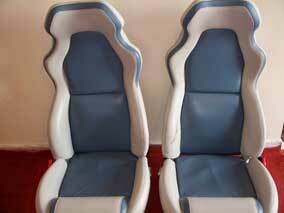 Large Kit - Will do 5 car seats or a large 3 seater sofa! 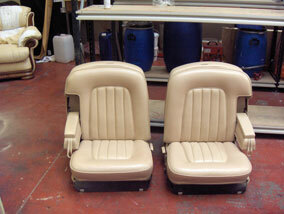 Extra Large Kit - Will restore a full car interior or three piece suite! The kit doesn't have a shelf life. However, the longer it sits on the shelf, the more thoroughly the products will need to be shaken before use. Click on one of the links below to see before and after photos of what the colourant kit can do. A fine result can be achieved with our kits, remember they are designed for the general public and so have been made as easy as possible to use. 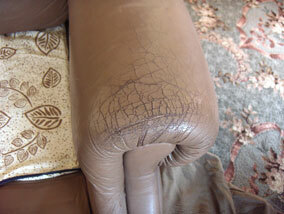 For detailed instructions of how to dye leather, please read one of the following guides. 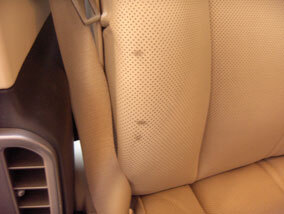 What is the difference between the Leather Colourant Kit and the Complete Leather Repair Kit. 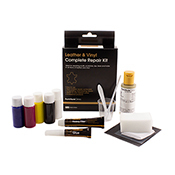 The Complete leather Repair Kit provides enough colourant and the right equipment to cover touch ups to small areas and minor repairs. 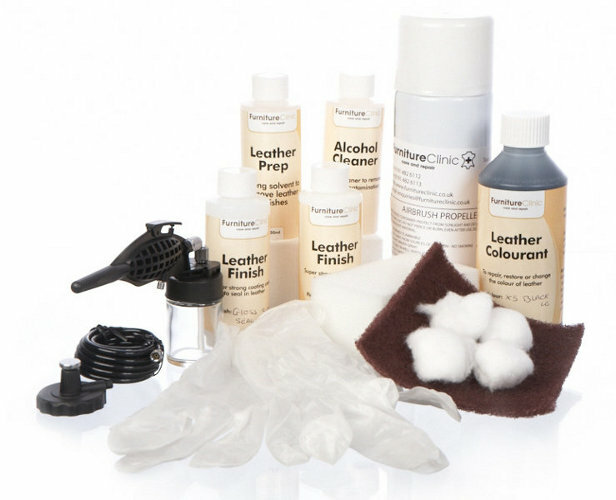 The Leather Colourant Kit comes in various sizes and the range provides enough colourant and the correct equipment to take on larger restoration projects, from colouring over medium-large scale repairs to complete colour changes to car interiors or three piece suites. I want to change the colour of my leather item, should I use the Leather Colourant Kit or the Leather Re-Colouring Balm? The Colourant Kit should be used when changing the colour of your leather, the Re-colouring balm should only be used to restore colour to leather and not to change it. 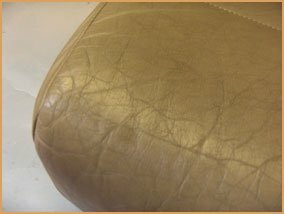 The colour of my leather has worn/faded and I want to restore it, do I use the Leather Re-Colouring Balm or the Leather Colourant Kit? 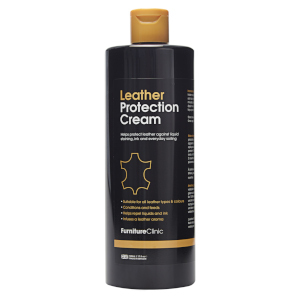 To restore the colour to worn/faded absorbent leather items (such as Aniline or Pull-Up) you should use the Leather Re-Colouring Balm as this will soak into the leather and quickly restore the colour to its former glory. 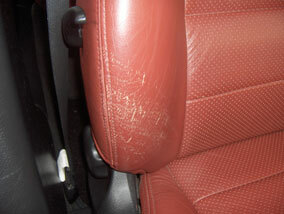 The balm can also be used to restore colour to areas on non-absorbent leathers where areas of minor-cracking have occurred and the natural leather is exposed. 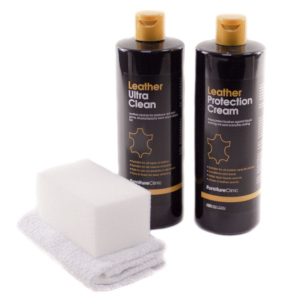 To restore the original colour to non-absorbent leathers where more significant areas of fading or wear has occurred you should use the Leather Colourant Kit. 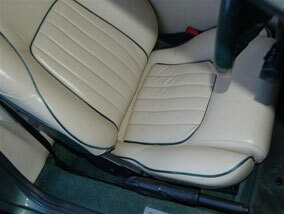 Is the colour/finish provided by the Leather Colourant Kit permanent? If applied correctly, the finish/colour provided by the kit can typically be expected to last as long as the original manufacturers finish would taking into account conditions and wear & tear. 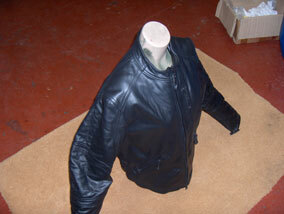 Im unsure what size Leather Colourant Kit I require for my project, is there a general guide or 'rule of thumb'? 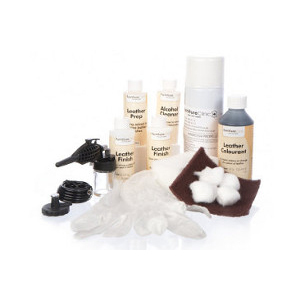 The small kit provides enough product to tackle repairs & restoration to the colour of smaller projects such as a footstool, shoes, clothing or a single car seat. 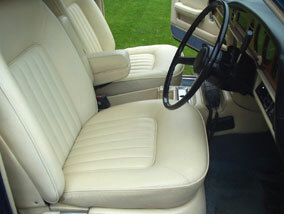 The medium sized kit should be sufficient to re-colour larger areas such as an armchair or two car seats. 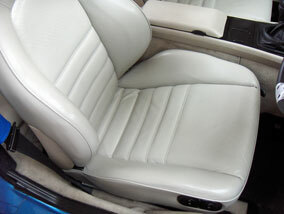 The extra large kit has been designed for a full car interior (5 seats, door cards, centre console, dash, and all other leather areas) or an entire three piece suite. Although every project is different, this guide provides a good overview of the scale of projects that each size of the Leather Colourant Kits in our range is suitable for. If in doubt it is always better to go one size larger, providing all of the colourant and finish you need, with some left over for touch-ups should they be needed going forward. Can the Leather Colourant Kit be used on Vinyl? 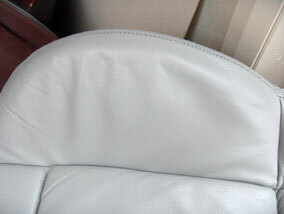 The colourant used in the kit can be used on Vinyl, but the colourant layer will not adhere as well to the surface Vinyl as it does on leather. To counteract this, we advise that you apply our Adhesion Promoter before spraying on the colourant, this will ensure a suitable surface for the colourant to adhere to and provide better results and longevity. I want to change the colour of my leather clothing/jacket/sofa/furniture/car interior, is the Leather Colourant Kit suitable for this? 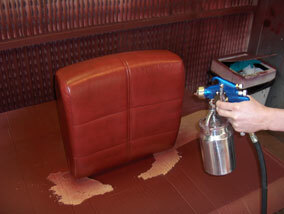 Yes, the Leather Colourant Kit can be used to change the colour of any leather surface, no matter what the item may be. I have a specific colour i require for my project, can you provide this with the Leather Colourant Kit? Yes, we can provide kits with any colour you require. 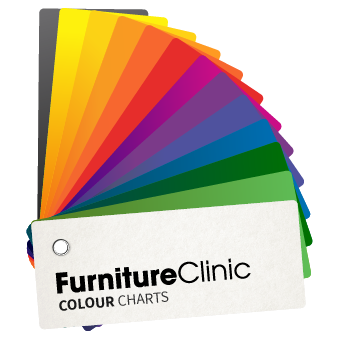 Simply pick a colour from one of our colour charts or send us a sample and we will match it and send it to you. If you wish to have a colour matched, just indicate that you will be sending a sample to us by ticking the corresponding box when you go to add your choice of kit to your basket on the Leather Colourant Kit page. 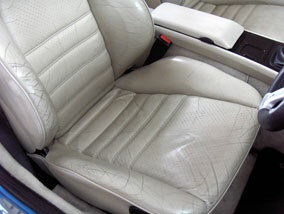 Can i continue to clean and maintain my leather as normal after using the Leather Colourant Kit? Yes, but it is important that you do not clean or applying protection cream to the leather item for 7 days after applying the colourant (though it can be used after 24 hours). 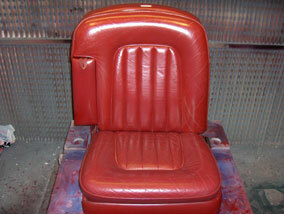 This gives both the colour and the finish time to fully cure before being treated. 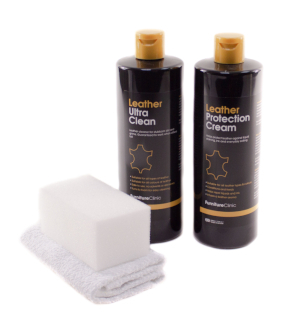 For total maintenance and cleaning of any leather item we recommend our Leather Care Kit, providing powerful protection and cleaning for any leather item in one handy pack. 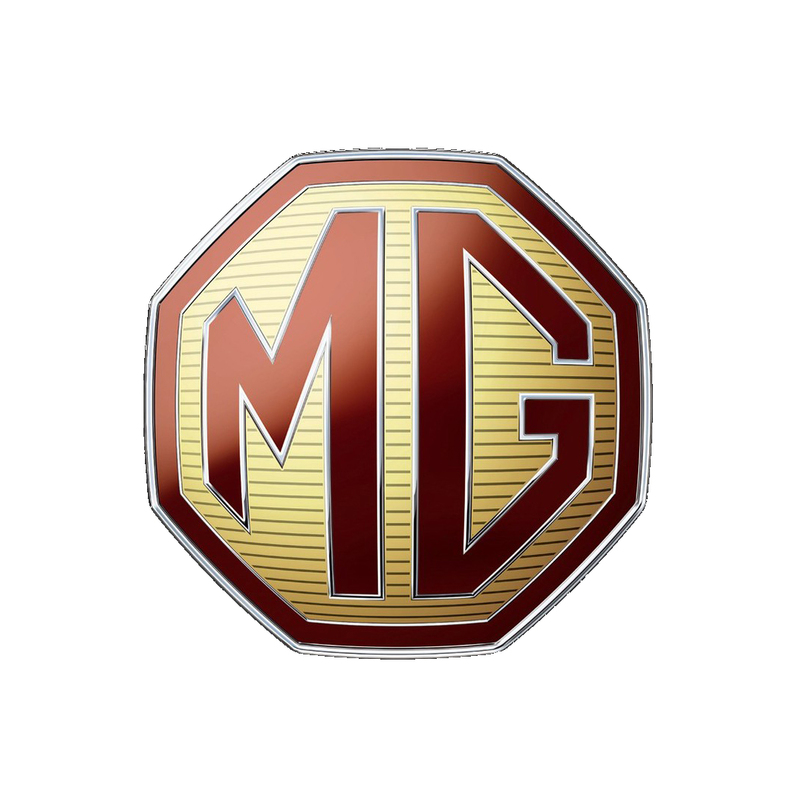 Select a car manufacturer to view the colours we have previously matched. We offer a wide range of pre-mixed colours as can be seen below. 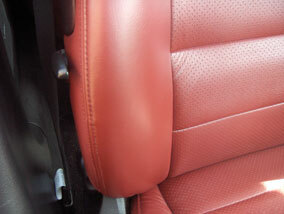 These colours are best suited when you are changing the colour of leather. 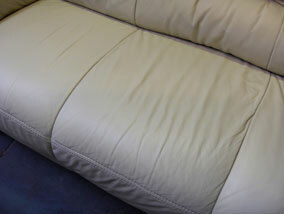 If you try to use our Beige (BO2) from the samples below to fix a small area of colour loss on your beige leather sofa for example, the chance that our beige matches exactly the colour of your beige is very unlikely. This is because there are unlimited colours in the world with millions of variations of beige. In this situation, it is always best to simply post us a sample of your leather and we can match it precisely using our spectrophotometer. 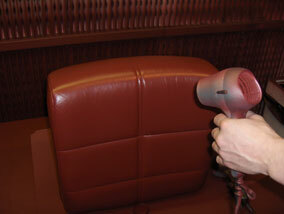 This uses lasers to scan and dispense the perfect colour match of your leather. You can see where to get a sample from here. 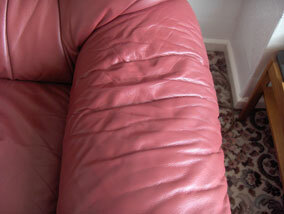 Bought this in 2008, and changed our sofas 2seater x 2colour from red to black and they still look fab. Now it's time to make them grey, this is a super kit. I can't convince you enough, it is brilliant!!!!! Delighted by the finish of these products. 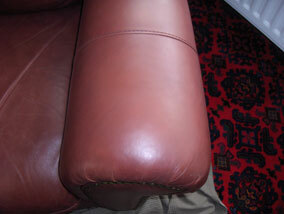 We had a red antique finish chesterfield, that had the antique finish worn away. 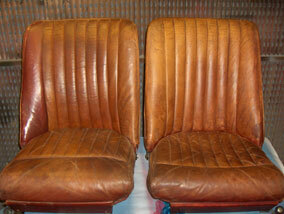 The restoration kit did a marvellous job. Had a few problems with spray cans, but found running them under lukewarm water kept everything moving. 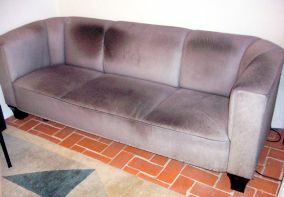 Sofa looks like new. 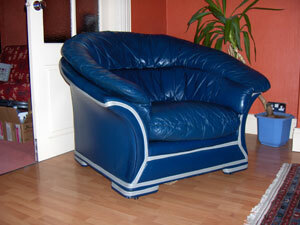 The other sofa is a single colour chesterfield. 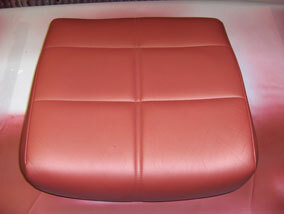 We used the semi matt finish and the seat cushions have come up beautifully. 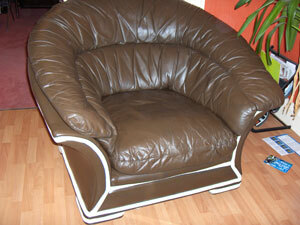 Going to do the chesterfield chair now as we are so pleased. You do need to take your time and follow the instructions, but if you do, the results are fabulous. I was prepared to be underwhelmed when my wife ordered the leather colourant. 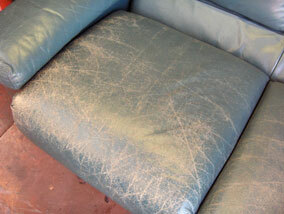 We spent a good time preparing and cleaning the sofa and I think this was helpful as the result is amazing. 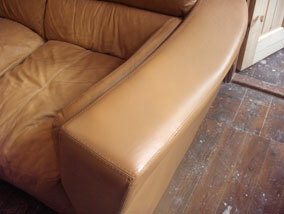 The first few coats made me a bit twitchy and I thought it was not going to work. As we built up the layers it really started to look good. 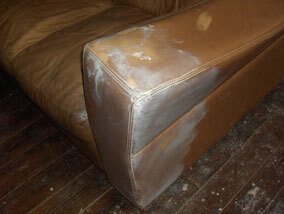 We used the semi matt finish and it made the sofa look like it was only a couple of years old. It is actually about 12 years old. The airbrush worked okay, but there was an issue with getting the can adapter to work, but once that was sorted it did a good job. This process takes a good few days so make sure you have the time set aside. 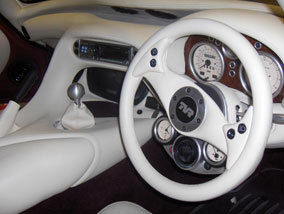 BMW dashboard leather colorount kit. I am absolutely amazed with service I received and how good and helpful these guys are! About the product I can tell absolutely the same! Just simply amazing product to use, colour match is 100%, but you have to follow instruction, so follow it! I done it first time and the finish is even better than original bmw! Also very good price, worth it every pound! Outstandingl! Thank You! I don't normally review anything I buy online but here I make an exception. I am so impressed with the Colourant kit. 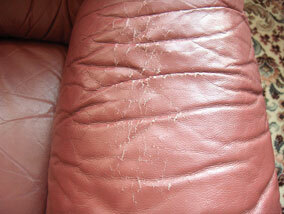 My cat had foiled on my leather couch and after using harsh chemicals the colour peeled off. I got rid of the smell but also of the colour. I had a huge orange patch on my couch. I viewed a few videos online and decided to try this kit. I am not exaggerating the colour match is perfect the instructions where easy to follow. I'm so happy I tell everybody how impressed I am. Defenetly recommend these products. Oh, and delivery was super fast too ordered it on Sunday and it arrived today Tuesday. Many thanks to Steve, who queried my order and then talked me through want I actually needed. Order very quickly despatched. For a first attempt I'm very pleased with the results and I'm sure I will get an even better result next time. Bought leather restoration kit and have just got round to trying it.Had sent a sample piece of suite for colour match as only the arms and the backs where there was fading needed doing. The colour match was perfect and as the instructions were so easy to follow our suite ( which is over twelve years old) looks like new.Thanks very much for the help I had when ordering. Once again a big thankyou. Lynne B. Excellent product with good clear instructions on how to respray the sofa, the colour match was brilliant and is worth the extra money if you are patching up a small area. Just for information for future customers living abroad they cannot send the propellant by airmail, due to flight legislation on canisters. I locally hired a small compressor with the correct attachment to do the job at minimal cost and works perfectly. The instructions were very clear. It took longer to do than I had thought but the result was fantastic. 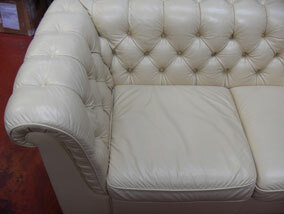 I changed a bright yellow leather arm chair into a cream one. My friends can't believe I have done it and they said it looks like a new one! I would thoroughly recommend your product. The after sales contact was good as well which is unusual these days. 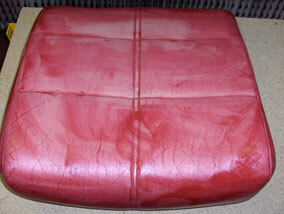 We had purchased a new leather three piece suite in an ivory colour but had retained the pouffe from our old pink suite. We bought the leather colourant kit to match the colour of the new suite and 18 months on the pouffe is still immaculate with no sign of wear on the new colour finish despite daily use. 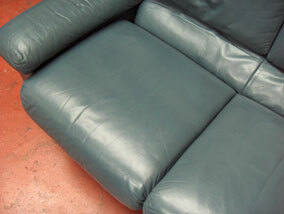 We would highly recommend this product for ease of use, depth of finished colour and durability. 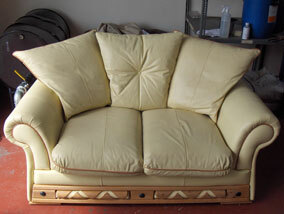 I have a 10yr old cream Habitat sofa that we wished to keep. 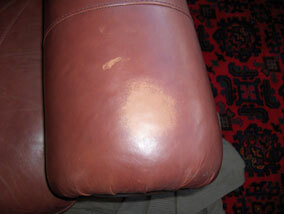 The sofa is structurally perfect however cosmetically the leather surface is extremely cracked and the paint has come adrift especially in the graining; it was about to be thrown out but based on an enquiry with Furniture Clinic, I ordered the leather colourant kit to try out instead of spending £2000 on a new sofa. The kit comes with very comprehensive instructions and everything that is needed including an airbrush kit. As with all painting, surface preparation is essential. 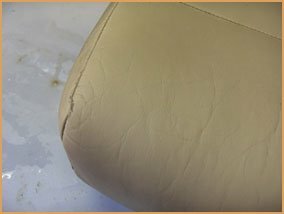 On the first leather cushion base, I used the prep and cleaner but found it easier to spend more time as well removing the old sealer coat and imperfections with 1200 grit paper. Due to the light cream colour (that Furniture Clinic matched for me), I sponged on a few layers of paint, drying between coats before a final air brushing. 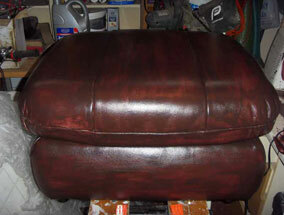 2 coats of gloss sealer and 1 coat of semi-Matt sealer and the first cushion base was done after half a day. Make sure the applications are done in a well ventilated area, even in an open double garage the airbrushing 'fumes' can build up. 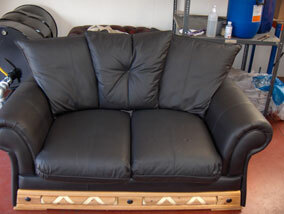 Another complete day and the sofa has been finished. 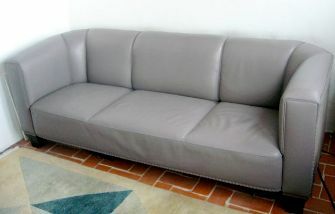 The sofa looks fantastic, even my wife was really impressed. A couple of work colleagues are also interested in carry out a similar project too having seen a before/after photo of my 1st cushion base. 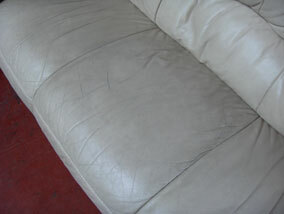 The assumption is that with continued leather care, the new Furniture Clinic leather paint and sealant will provide a few more years 'service from the sofa'. Although I can't comment in the durability side, as it stands, based on the initial amazing transformation, I'd fully recommend the leather colourant kit. Restored my sun bleached distressed tan sofa, couldn't spray the colour on as it was in situ sponged it on instead, totally successful very happy and simple to do, looking for next project. 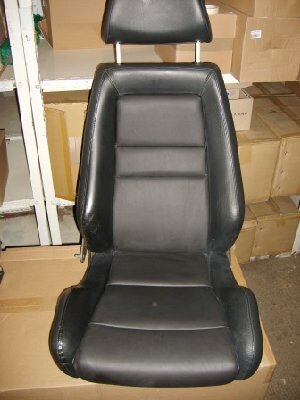 I had purchased an Alfa 156 with blue leather seats and door panels and wanted to change their color to the black alfa leather look. 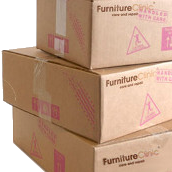 I got all the stuff I needed from furniture clinic together with simple to follow instructions. I am not particularly good at DIY jobs but decided that I wanted to give this a try. Once you follow the instructions, the end job is a professional finish. The do's and dont's are also very simple. Do exactly as the instructions say and don't try any short cuts. The result is very satisfying and I have received many compliments and some requests to do little jobs for friends of mine. I hope others will try this out and sure that they will be equally satisfied. Wouldn't hesitate ever having to buy it again. 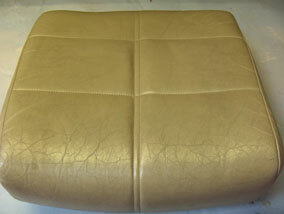 Easy to follow instructions and quality product has transformed a tired and worn out leather suite into something looking brand new! I fully recommend this product. 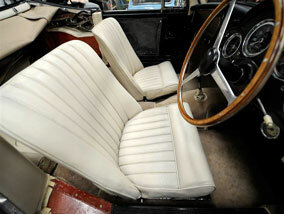 My wife and I had never tried to do anything like refurbishing car interiors before, but by following the simple step by step instruction our 1957 Daimler conquest has had its drab cracked brown leather seats transformed into a cream leather finish that has left our friends gob smacked. 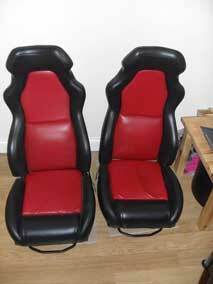 When I phoned the furniture clinic for advise they were not only helpful but very patient, 10 out of 10 will be definitely be using them again on future projects as its put a very easy couple of thousand on the selling price of our car. Overall very pleased with the products supplied and instructions written. 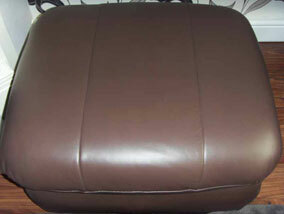 Excellent delivery and overwhelmed with the results on our brown leather settee. We took before & after pictures and it looked brand new. 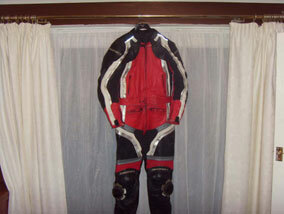 Item did the job excellent , however i paid for next day delivery & the item took 6 days to arrive !!!! I emailed company re; refund for postage, i'm waiting for reply to my email & still haven't received refund of postage. I look as if I have a new suite, the colour matched perfectly and the price was excellent too. 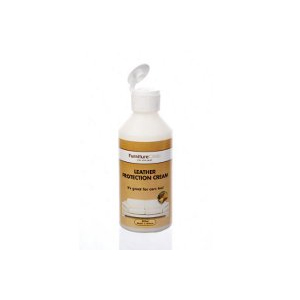 The product was excellent and has made my suite looking new again . Very simple and straight forward to use too. 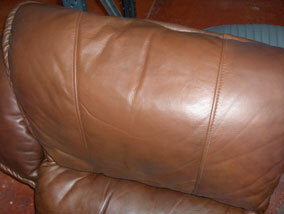 I recently dyed my red L- shaped leather sofa a chocolate brown. Having never attempted such a project before, I was quite nervous and concerned that the outcome might be disastrous. However, it could not have been easier, thanks to your fantastic product and clear instructions. I followed them to the letter and am delighted with the result. It has breathed new life into my battered old sofa. I could not have wished for a better outcome. 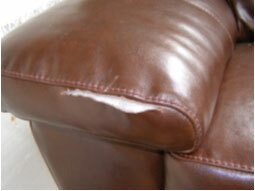 I wanted to repair some worn patches on our settee. It worked a treat and saved us having to buy a new suite. 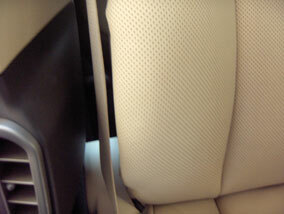 followed instructions on pack ; car seats and door cards came up like new.